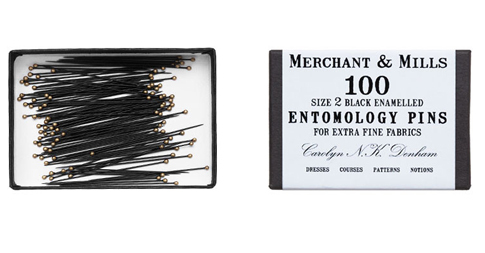 With its vintage nostalgic typography, minimal black, white and brown card, how could you not fall in love and immediately purchase this stylish Merchant and Mills Sewing Notions Set from Kaufmann Mercantile. Not only am I sold on its striking packaging, but the tools themselves seem to be of a very high quality and fit well with my desired aesthetic of a black and white palette. I’m also pretty excited about the beautiful black pins with gold heads, ooh too much excitement over here. After finding the Actual Merchant & Mills website they also have a whole lot more of delightful products to adorn and service your sewing room, check out their labels to turn any can into a pattern weight.